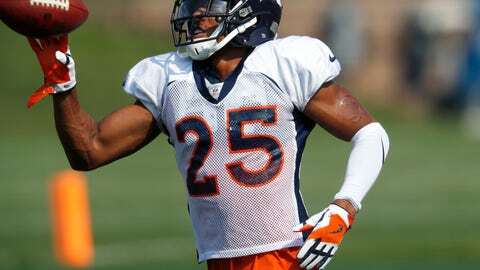 ENGLEWOOD, Colo. (AP) — Chris Harris Jr. is one of the best cornerbacks in the NFL. For the first time in his eight-year NFL career, he’s actually the top cornerback on his own team. Harris has played alongside Champ Bailey, Dominique Rodgers-Cromartie and Aqib Talib during a stellar career that began with him as an undrafted free agent out of Kansas and includes three trips to the Pro Bowl and two All-Pro honors to go with a Super Bowl ring. The Broncos traded Talib, whom Harris first played with in college, to the Los Angeles Rams in a cost-cutting move this offseason, ending the duo’s four-year run together in Denver and thrusting Harris into a new, leading role. Now, he’s not only being asked to lock down opponents’ top receivers but serve as the unquestioned leader at his position. Long considered the top slot cornerback in the NFL, Harris is preparing for expanded duties in 2018, moving around a lot during training camp. When Talib was traded, he said he’d miss playing with Harris, his college teammate at Kansas, and Harris is certainly having to adjust to life without Talib next to him. Right now the Broncos’ cornerbacks corps is a work in progress. With Talib owed $11 million this year and $8 million next season, the Broncos needed to clear both salary cap space and room for Bradley Roby, a former first-round pick who’s getting a big pay raise from about $1 million in 2017 to $8.526 million this year in the final season of his rookie contract. Asked how long it will take to get that chemistry with Roby, Harris laughed. The Broncos brought on veteran Tramaine Brock, but he’s been dealing with a pulled hamstring, opening up opportunities for rookie Isaac Yiadom, who’s been taking more of the snaps from second-year pro Brendan Langley as the third cornerback. Notes: The Broncos’ first depth chart came out and it listed top draft pick Bradley Chubb as the starter at SLB opposite WLB Von Miller with fourth-year pro Shane Ray listed as Miller’s backup. RB Devontae Booker was listed as the starter ahead of rookie Royce Freeman and Paxton Lynch was listed as the backup QB ahead of Chad Kelly, who outplayed Lynch in the scrimmage last weekend. … Undrafted rookie RB Phillip Lindsay was listed as the No. 1 kick returner with Isaiah McKenzie, who fumbled six times last year, the top punt returner.